It’s a very busy time at Tresorya! 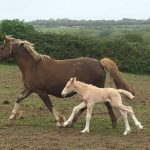 Today we welcomed another new arrival – this time a very pretty Full Welsh Cob Section D Palomino Filly – Tresorya Rhianna. Another foal with 4 whites! Her Sire is Cremello Tresorya Cornish Cream and her dam Cyfyng Rhian, both with excellent bloodlines and a lovely temperament. All of our stallions have a wonderful temperament which they pass on to their offspring. The mares too are chosen for their temperament as well as their bloodlines. Rhianna is a very smart foal and will be offered for sale.